Some bands seem to exist just beneath the radar, somehow escaping the discerning ears of fans in search of quality death metal. 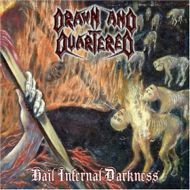 Seattle's DRAWN AND QUARTERED would seem to fit that description, but after 2004's "Return of the Black Death" and this year's "Hail Infernal Darkness", the ripples should begin turning into waves. The bottom line is that if you are a fan of the style played by bands like INCANTATION and IMMOLATION, then you absolutely must seek out this group's albums. "Hail Infernal Darkness" is a good place to start, it being the definitive representation of the band's work. It all starts with that old school, charred and smoke-damaged sound. Though clarity may suffer slightly, the ten-ton thud of the rhythm section, the thickness of the riffs, and vocalist Herb Burke's foreboding bellow more than make up for it. It just wouldn't sound right any other way. Musically speaking, I initially found the race between the new disc and "Return of the Black Death" to be neck and neck, with one glaring exception. K.K. Kuciemba has taken his guitar solos to a whole new level on "Hail Infernal Darkness". And I'm not talking about meaningless shred. Though the fearful fretwork is impressive and speedy, what Kuciemba has mastered is the art of expressing feeling (in this case the sick and dreadful kind) through his instrument. When Kuciemba's lead flies out of the speakers during the first moments of album-opener "Procession of Pain", those six strings turn mere notes into demonic screams. Throughout the album you'll hear the man wrenching agony, fear, and pain out of that mighty axe. When those twisted riffs and sizzling leads ride over top of the bone crushing rhythms of bassist Greg Reeves and Dario Derna (KROHM, ABAZAGORATH) you'll think you died and went to…Hell. As for the songwriting, it is bit more memorable than "Return of the Black Death", though it doesn't become obvious until the third listen or so. "Genocide Advocacy" and "Blood of a Million Martyrs" are good examples of the band's skill at sneaking a little melody into the equation without interrupting the butchery. This is certainly brutal stuff, but it is not without a rhyme and a reason. Little by little, lines from individual songs began bouncing around in my head, "you can call me adversary" (from the title track) for whatever reason doing most of the bouncing. While the tracks are mostly up-tempo, a song called "Throne of Desolation (Befouling the Scriptures)" lands right in the middle of the album with a mid-tempo bludgeon beat and one of the doomiest riffs this side of INCANTATION. It is pure bliss. You'll hear the occasional doom-laden riff and morbid tempo shifts on the speedier tracks as well. I'm also noticing that Wichita, Kansas' BTK serial killer, Dennis Rader, is quickly becoming death metal's newest lyrical darling; joining PUTRID PILE and LOW TWELVE, DRAWN AND QUARTERED toss "Bind, Torture, Kill" into the bloody mix. It too is a righteous hymn of depravity. I have no doubt that "Hail Infernal Darkness" will end up one of my favorite death metal albums of 2006. Yeah, and it's only February. Support true death metal, buy "Hail Infernal Darkness". It's that simple.